« I Won! I Won! Better After 50 (BA50) Is Fun and Informative. Parents of patients can be the best part of my practice. Some are courageous, some are just fun. Others are a challenge (which I usually like), and others teach me a lot. But there is only one Dr. John Sterba, MD, PhD, FACEP (Fellow of the American College of Emergency Physicians). He brings his practice to his patients. 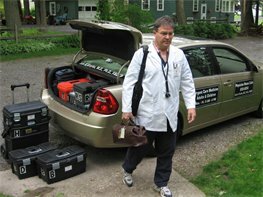 Board certified in emergency and urgent care medicine, his office is his fully equipped automobile trunk with the “tools of the trade.” Children and adults, home bound or not, he travels the greater East Aurora area and meets you at your office, your home, your hotel room, the nursing home or wherever. No waiting times (for you, and hopefully not for him either) and the convenience and privacy of the place of your choosing. Immediate, Urgent, Routine & Minor Emergency Care expertly provided. All Illnesses & Injuries treated using Portable ER (83 specialized cases). X-Rays are done locally, immediately read and explained by “Dr. John”. Rapid Diagnostic Tests and certain Blood Tests are done, printed and read in 4-12 minutes in the home. Any other labs are taken to local labs by “Dr. John”. Dr. John Sterba is a quiet and gentle man. He has a different kind of mission and a different way to deliver his gifts. You can find out about him through www.physicianhousecalls.com or contact him by email: physicianhousecalls@roadrunner.com or 716.998.7474. His hours are 9 a.m. to 8 p.m. Monday through Friday. I teach the pre-medical and pre-pre-medical students, that there is not one “way” to be a doctor. Dr. John Sterba is one of those physicians whom I am sure has a whole lot more to teach on this than do I. Thanks Dr. John for your innovation and your inspiration.